Posted on October 5, 2018 | Comments Off on Have You Considered Collagen? Most well known for its structural role in the body, collagen is a member of a family of naturally occurring proteins. As the single most abundant protein, collagen makes up 25 – 35 percent of whole-body protein content. There are at least 16 types of collagen, all responsible for a number of important biological functions. However, 80 – 90 percent of the body’s collagen consists of type I, found in bones, tendons and organs; type II, found mainly in cartilage; and type III, largely found in reticular connective tissues in the kidneys, spleen, lymph nodes and bone marrow. Briefly, type IV collagen is found primarily in the skin and type V in hair and cell surfaces. Often found working with keratin and elastin, large amounts of collagen is observed in connective tissue, where it provides tensile strength in tendons and ligaments, as well as strength, firmness, suppleness and elasticity to the skin. Collagen provides both rigid and compliant structural support, allowing tissues to stretch as needed. In the dermis, collagen helps to form a fibrous network of cells upon which new cells grow. Skin cells are constantly renewing, and collagen aids in their growth and repair. The normal aging process causes collagen levels to deplete naturally over time, contributing to osteoporosis and often resulting in facial lines and wrinkles, stiffer and less stable joints, and a higher chance of tendon and ligament injury. Avoiding tobacco and excess sun exposure, reducing physical stress, following a healthy diet and getting regular exercise may help to protect collagen, support joint function and reduce visible signs of aging. Vitamin C is a critical factor in collagen synthesis and limits damage induced by sun exposure, providing beneficial effects on skin health. Adequate vitamin C has been shown to stabilize collagen and increase collagen protein synthesis, aiding repair of damaged skin. As a protein structure, collagen is largely composed of amino acids. Dietary protein whether from animal or supplemental sources helps supply the necessary amino acids to build collagen protein. Gelatin, found in bone broth or powdered supplements is another rich source of collagen and can provide a healthy dose of amino acids for collagen formation. Collagen contains glutamine and glycine, amino acids known to help repair the delicate gut wall. Leaky gut or intestinal permeability allows unauthorized particles and toxins to enter the bloodstream through the intestinal wall, contributing to autoimmune conditions, hormone imbalances and digestive issues. Additionally, glycine helps to protect against liver damage, aiding toxin elimination. Collagen helps to protect the mucosal lining, aiding complete digestion and absorption. Even with a healthy diet, insufficient digestive function may deprive the body of critical nutrients necessary for optimal health. Collagen’s amino acids nourish hair, skin and nails, helping to provide more lubrication elasticity and strength, as well as reduce visible signs of aging. Collagen has been shown to support healthy joint function and help relieve typical aches and pains associated with aging and chronic inflammation. Collagen helps to lubricate joints for easier movement, may decrease swelling in arthritic conditions and may reduce the risk of joint deterioration. Oral collagen supplementation can help support skin structure and bolster the body’s natural collagen production by delivering the specific amino acids necessary for collagen synthesis. Supplemental hydrolyzed collagen peptides provide both nutrients and bioavailable amino acids that can be readily absorbed into the bloodstream. These highly absorbable nutrients may help to improve skin, hair and nails, relieve painful joints and optimize gut health. Taking vitamin C along with collagen may aid bioavailability, digestion and absorption of supplemental collagen. 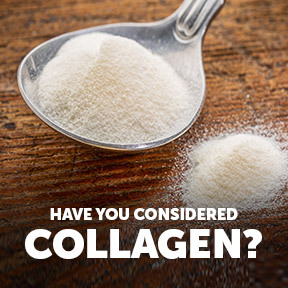 Hydrolyzed Collagen Plus with Hyaluronic Acid by Douglas Laboratories®: This unique powdered formula provides ideal ratios of hydrolyzed collagen blended with hyaluronic acid. It includes vitamin C, zinc and copper, co-factors that support healthy collagen formation, skin elasticity and hydration. No additional ingredients. Super Collagen + C™ by Neo®Cell: This collagen/vitamin C formula provides specific amino acids vital to collagen formation in support of skin, hair, nails, bones and joints. Free of gluten, soy, wheat, lactose, yeast and artificial flavors. Non-GMO formulation. Beef Gelatin 100% Pure Collagen Protein Unflavored by Vital Proteins®: This nutritional powerhouse provides all-natural, high quality collagen protein sourced from grass-fed, pasture raised bovine hides. Formulated to support youthful skin, healthy hair, and strong nails, as well as healthy bones, joints and digestion. Kosher, gluten free, Non-GMO powdered formulation. Collagen II Joint Formula by Collagen M.D.®: This nutrient-rich formula provides type II collagen proteins, 18 amino acids, vitamin C and a natural blend of chondroitin, glucosamine and hyaluronic acid to help maintain and support cartilage and joint health. Free of gluten, dairy, sucrose, starch, yeast, wheat, soy, and corn. Collagen Types 1 and 3 Capsules by Doctor’s Best: This science-based nutritional formulation provides pure collagen proteins and vitamin C for essential structural support for hair, skin, nails, tendons, ligaments and joints. Collagen JS 1000 mg by Pure Encapsulations®: This formula provides patented, hydrolyzed and denatured BioCell Collagen II® to aid and promote collagen synthesis and enhance synovial fluid, supporting the composition, integrity, and motility of joints. Gluten and soy free, Non-GMO formulation. This entry was posted in Home and tagged Beef Gelatin 100% Pure Collagen Protein Unflavored by Vital Proteins, Collagen, Collagen II Joint Formula by Collagen M.D., Collagen JS 1000 mg by Pure Encapsulations, Collagen Types 1 and 3 Capsules by Doctor’s Best, Have You Considered Collagen, Hydrolyzed Collagen Plus with Hyaluronic Acid by Douglas Laboratories, Super Collagen + C by NeoCell. Bookmark the permalink.